On 6th October 2014, a high temperature variation near the Andaman Island helped a storm to rise, which developed into a major cyclone until 9th October and hit the coast of Andra Pradesh. Shortly before landfall near Visakhapatnam, Andhra Pradesh, on October 12, Hudhud reached its peak strength with three-minute wind speeds of 175 km/h (109 mph) and a minimum central pressure of 960 mbar (28.35 in Hg) causing a damage to roughly half a million people. The importance of housing in the nation is increasing with the increase in the population of the country resulting in lack of efficient systems of livability. Responding to all above issues, this project is a ‘rehabilitation program’ for the fishermen community who suffered due to the cyclone. 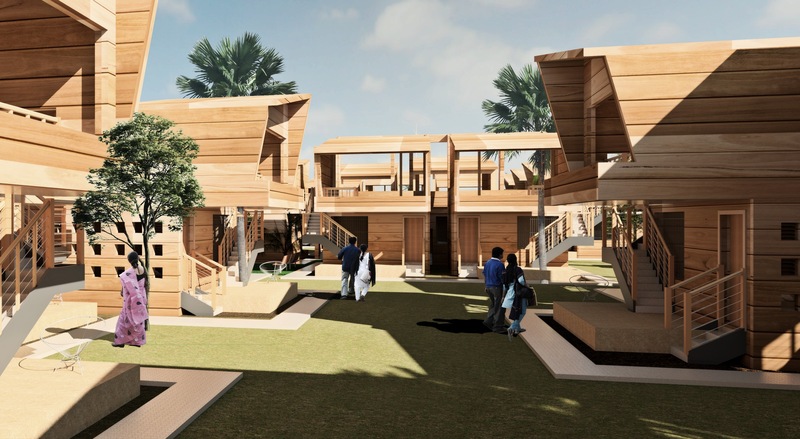 This project would be perceived as a time concern, low cost building system as a proper solution for areas where there is cyclone vulnerability and at the same time support the native communal values of the community to familiarize and move forward with the new site and the system. The project is restricted/ challenged with its environmental context, social and cultural context, economical context and technological context. In order to tackle the challenges, the project was manipulated based upon two considerations which are generic and specific implementation of problem solving process. The planning of south Indian temples have a peculiar feature of the orientation of their primary circulation ways that are aligned with the local temples or holy places of importance. To keep a check on the contours and the rainwater in the season, the steepest points in the ridges become the access ways for both pedestrians and water channels giving easy circulation for both these important considerations. The sequence of the work is primarily divided into three parts, LINEAGES, IMPULSES and PRINCIPLES. LINEAGES – Ideations from the works of Ar. 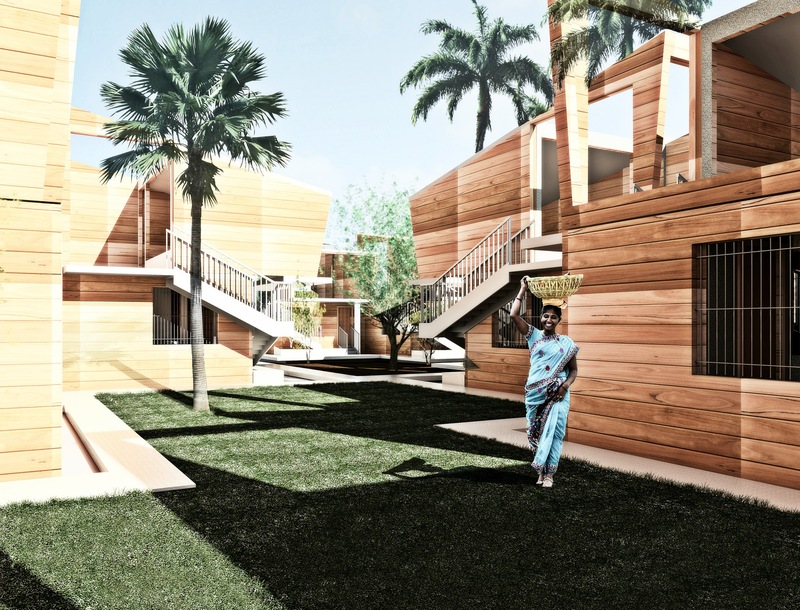 Charles Correa were sourced in accordance with his proposal for cyclone victims’ housing in 1974. Contours, Winds, Fishermen, The Bay of Bengal, Rural Community and the Vegetation. PRINCIPLES – Since the project has an aspect of resilience to be considered, the principles that were appropriate were classified into DESIGN BASED (Symmetry, Axis and Balance) and FORM BASED. (Voids, Enclosures and Openings). 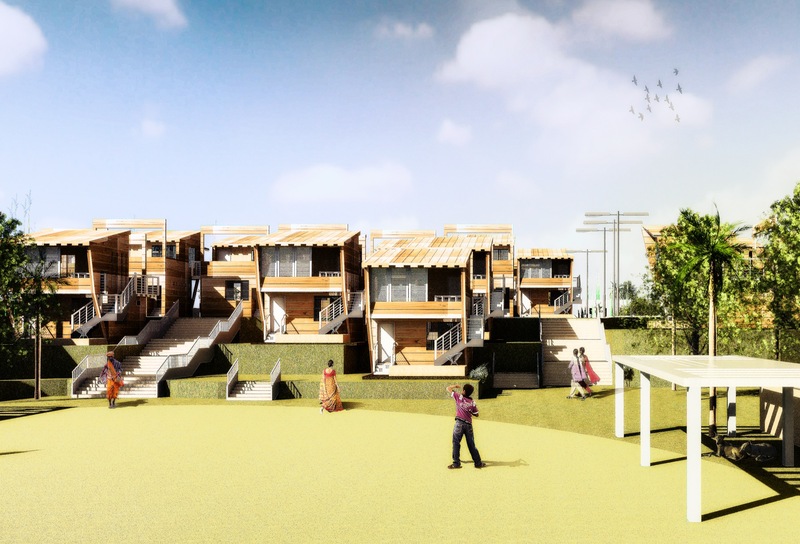 THE MODULAR THEORY – The idea of housing for rehabilitation must involve aspects that should look beyond aspects of housing that we observe around the nation hence the idea of modularity is applied to look at psychological aids such as territory, convenience, safety and ownership. 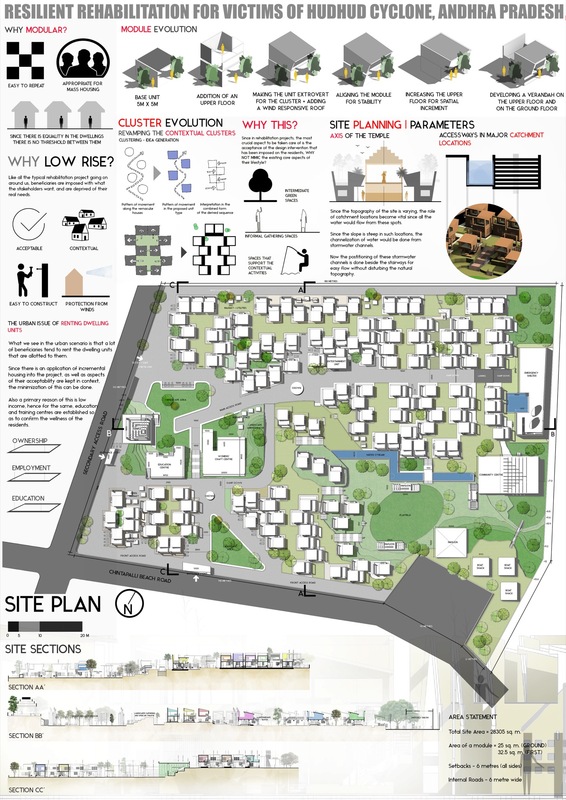 CLUSTERING RATHER THAN ROW HOUSING – The application of modular theories can be applied in various manners typically row Housing programs that really achieve the density of housing that is needed along with an idea to maintain their ‘close knit habitat’ would be cluster housing. 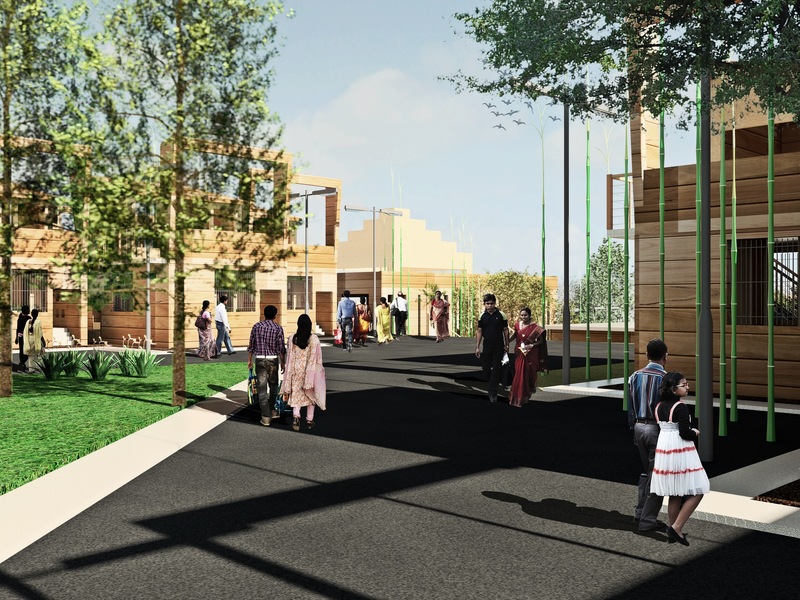 SITE PLANNING – Apart from the housing modules, the various contextual aspects lead to the design of various skill and education development centres in the form of Womens’ Craft Centre and Education Centre along with T.V./ Entertainment Rooms, Boat Shacks, Pavilions and Market Places.